Two and a half and full of smiles, patient superstar Noah steals your heart the moment you lay eyes on him. 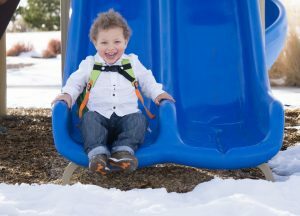 His family believes he’s the happiest kid on earth, and we’re excited to share his story in honor of Feeding Tube Awareness Week. Noah joined the Aveanna family back in 2017 after being hospitalized for failure to thrive and Respiratory Syncytial Virus (RSV). He came home with a nasogastric tube (NG tube) for six months and later graduated to a gastronomy tube (G-tube) for his nutrition needs. Noah is the second child in the United States to be diagnosed with cricopharyngeal achalasia (CA), a rare swallowing disorder. He’s also diagnosed with dysphasia, sensory processing disorder (SPD), and silent aspiration. Noah is non-verbal, has global developmental delay, and was recently diagnosed with level 3 autism. In just observing Noah’s demeanor, you’d never know he has faced so much adversity. He jumps, gallops, and skips everywhere he goes. He enjoys playing catch and matching shapes, colors, and textures. He loves music, especially the song Head, Shoulders, Knees and Toes. Noah can be very introverted, but also has moments where he is very outgoing and interactive. “Through all of this, our family has come to realize how significant food and eating was in our house. We have five kids, and Noah and his little brother Micah are on feeding tubes. Our family gatherings, holidays, birthdays, Christmas stockings, Easter baskets, and more were centered on edible treats. Can you imagine a birthday party with no birthday cake? We’ve since gotten creative and have had to learn how to make food an afterthought so that our boys don’t feel left out. Although they are 100% tube fed, we always include them during meal time so they don’t miss out on the social aspect of meals. Especially with our fast-paced lives, I feel that it’s one of the most important times our family has together as we talk about our day and get to spend quality time together,” shares Mandy. Aveanna is so grateful we get to walk alongside and support Noah’s family in their medical journey. To hear more about this rock star family, stay tuned for little brother Micah’s story.